Lexington, MA July 16, 2015 - The Daymark ice cream truck is on a roll again this summer and after a makeover this past winter, it’s better than ever! 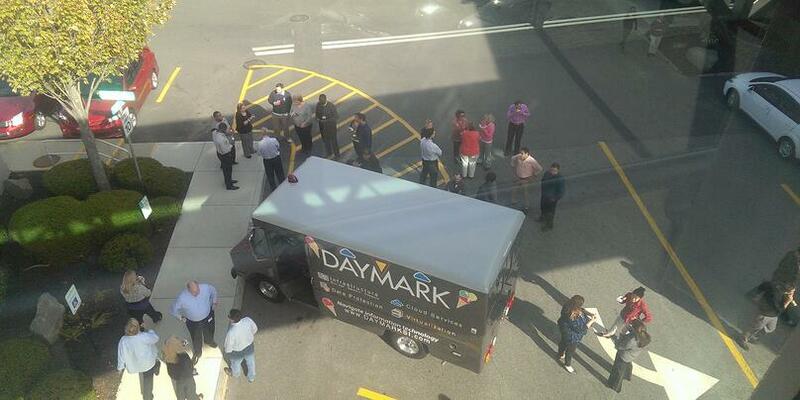 The Daymark ice cream truck is a real customer favorite sharing frozen treats at company offices and corporate events all over New England. The truck is in high demand, so now is the time to call your Daymark contact to schedule a visit. Why does Daymark have an ice cream truck? Two years ago Corey Roberts, Daymark Director of Technology, who also moonlights as part of a NASCAR pit crew, saw an old ice cream truck for sale. It was in rough shape, but Corey had a vision that together with the help of fellow “Daymarkians” they could turn the ugly duckling into a swan. And that’s just what they did! Rallying 18 fellow employees, they clocked over 2500+ man-hours to refurbish the truck, working several weekends to get it ready to roll (literally) for some summer fun. It’s hot and who doesn’t love ice cream? A. The truck holds 400 ice creams. So 400 people can have one ice cream each or 80 people can have five each – it’s up to you! Q. Can I request special flavors? Q. What if someone has food allergies? What are you waiting for? Click on the link to schedule a visit. Your friends will thank you!